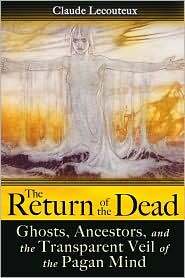 If you are looking for another book about how the dead continue to be part of our modern lives, how we can contact and commune with them . . . keep looking. This is NOT that book. Claude Lecouteux is a former professor of medieval literature and civilization, and uses his knowledge and expertise to explore the phenomena of revenants, ghosts, and other manifestations of the dead in medieval times. The book is more of a dissertation, drawing on hundreds of texts, historical and literary, to explore the relationships of the living with the dead. What becomes abundantly clear through these readings is that our ancestors did not view the line between life and death as the absolute, clearcut, “either/or” condition our modern sensibilities decry. The dead continued to “live” in their new state, and their interaction with the living was accepted and expected. The focus of the book leans very clearly toward the Germanic peoples, in large part because more of these texts have survived and are available for study. If you have an interest in and knowledge of Nordic and Germanic stories and legends, you will definitely have a quicker, more intuitive understanding of the author’s references. (If you have a copy of The Poetic Edda, it would be beneficial to read that before delving into this book.) Fortunately, Lecouteux provides many excerpts from the various texts, so intimate knowledge of the literature of the era and geography is not a prerequisite. Which brings me to an aspect of this book that is both helpful and frustrating. This book has been very well researched (the endnotes alone cover 34 pages). Lecouteux quotes text after text after text to illustrate each point he makes. In this way he is inviting the reader to accompany him as he journeys through the world of our ancestors, rather than expecting us to believe every word he writes simply because “I say so.” After a while, however, I found myself a little overwhelmed. It was almost too much information, and one story began melting into another. Overall, I would have to say that, while I found the information in this text valuable and thoroughly presented, the narratives joining the examples were not as cohesive as I would have liked. For example, Lecouteux touched on the challenges of interpretation of the various accounts, citing the Christianization of stories and themes over time. While this seemed to be a significant factor in his research, he would mention it almost in passing, as though he is reluctant to really delve into that challenge more. And the last chapter was also a bit jarring. After 200 pages set firmly in the Middle Ages, he suddenly jumped into the 21st century to ask how our perceptions have changed. I found it to be an abrupt transition, almost as though he realized that his time was almost up, and he had to finish quickly. I would call this a “2-pass” book. Having read it carefully once, I think that I really need to come back after digesting it a while to give it a second read. In-depth and thought-provoking, while it will be a valuable addition to your library, it is most definitely NOT a casual read. And for people interested in the John Edward/James van Praagh approach to death and the afterlife, save your money. This is not the book for you. But if you are interested in the interweaving of life and death in the daily lives of our ancestors, this is a must have. An observation on the translation: The Return of the Dead is translated from the French, and is an extremely good translation. I only had one instance where I had to revisit a sentence to fully grasp the grammar and context. Still, it is not an easy read. I consider myself a literate person, and I had to keep my dictionary close at hand.